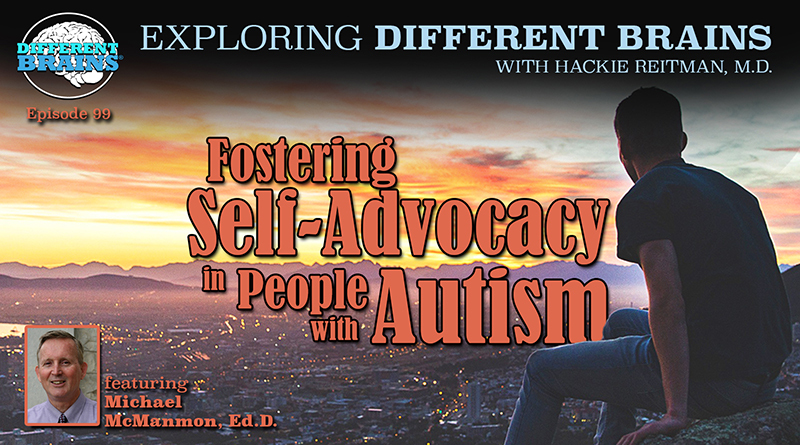 HACKIE REITMAN (HR): Hi I’m Dr. Hackie Reitman welcome to another episode of Exploring Different Brains. And we have as a guest, once again, Michael McManmon the founder of the College Internship Program. Michael welcome again to Different Brains. MICHAEL McMANMON (MM): Thank you for having me Hackie. HR: Michael, tell us about your educational background and your professional qualifications. MM: Well basically my path is a little different than most people. I started working with kids right after college in four different states and private programs and then I started my own group homes in Las Vegas and I sold those and started the College Internship Program about 33 years ago. But I got educated all along the way. I got a Master’s in counseling then a Master’s in human development then a Doctorate in special education, and then I got licensed as a psychologist while I was working. And the reason that was so good was because I had to do all of my papers and all of my experiments and everything and I was working with people with kids with parents the entire time plus having my own kids while I’m doing It. So I got to really make–and because I have Asperger’s I want everything to be practical and useful so my research was very practical in nature and it was really right, you know, on par with the curriculum I was trying to develop. So it was a benefit to me to be that to be educated that way and to be working while I was educated. HR: You were saying how corporations need an Aspie. And I’ll go further than that, they already have aspies and people with OCD and ADHD, and bipolar, and anxiety and depression, you name it, working for them. Recognize it, give them extra tools that they need, the accommodation they need, and they will do a better job for you and this is what I try to tell companies. it’s better for your bottom line. You make more money. They understand that part. MM: Exactly. So my friend Michael Wilcox, who you’ve probably have seen him speak before. He was a board member for AANE in Boston. He worked for Morgan Stanley, in doing their calculations and stuff, computer analytics for the stock market in a little cubicle, and retired in his 50s not knowing he had Asperger’s. And he could never keep a relationship but he did an amazing job for them. And had plenty of money and could buy a farm with cash and stuff. And so when he realized he was dating a woman and she said, “My family is very Catholic, and I want you to come to a baptism that we are having in our family and it goes on all day and we do all this stuff.” And so about a month later she said “Are you coming to the Baptism at this church? It’s at this time.” And he said yes. He comes to the baptism and he meets her there, and then afterwards and he’s going to drive off and she said “I told you how important this was to me, it’s like an all-day thing and everything.” And he realized that his social thinking was just that she just wanted him at the baptism because that is what she said to him. He didn’t think that was really a problem for him, he started to see that it really was. At his age he got diagnosed. You know the social thinking part of it, and my relationships people have said to me “You couldn’t have possibly think I meant that when I said that to you.” And I said, “That’s what you said and that’s what I did.” And then they look at me like I’m lying or that I’m just covering up for something. And they can’t believe that even after living with me that that’s what I would do. So it does have an effect still. HR: Well it still does, it is hard to believe. You know I talked about in the Aspertools book some of the stuff with my daughter Rebecca, who’s got a discrete math degree from Georgia Tech and is halfway through a master’s in Applied Psychology, that when things comes up when something is taking literally and they don’t know what the idiom means and they don’t get the social cue but it is trainable and it is learnable and neuroplasticity is a wonderful, wonderful thing, it is. But it would all go a lot better for society if we all embrace neurodiversity, recognized it and not made it such a big stigma. When I interviewed Steve Ronik–who is the head of the Henderson Behavioral Health down here which has 800 employees and sees 30,000 patients a year–he said Hackie, “Why is it that there’s no stigma if you go to your oncologist or the cardiologist but if you go to a mental health professional it’s like there’s a stigma to that, but we get better results,” you know, that kind of thing. HR: And a lot of it is that what are some of the things that you feel, now I know you’re writing books you’re in all kinds of media, you’re speaking around the country. To our different brains audience who want to help and volunteer and do something in their own life to be helpful what advice would you have for them in that regard? MM: If they’re going to volunteer there’s plenty of organizations to go now you know they can go to their local Autism Society or anything like that but one of the things I did want to bring up if it’s alright to change the subject was um in my new book there’s section called goodness-of-fit and I wrote an article on that section too – and what that is is that not only are we having employers choose us but it’s almost as important for an aspie kid to look at the sensory fit on a job, the emotional fit on the Job, the intellectual fit, whether that job is going to stimulate them enough the employer fit, what kind of person will they be working with you know all of these, the environmental fit. You know in Stevens Shore first went to work as an accountant when he got an accounting degree he couldn’t handle working in the offices of this accounting office said he tried to ride his bike and put it in the furnace room and he came in and he was sweaty and and it was in a cubicle with bright lights but if he had been in a small mom-and-pop accounting firm and in the backroom where they let him do whatever the hell he wanted like sort of like Michael Wilcox on Wall Street, he probable would still be there. So we were sort of fortunate that he didn’t work for them and he went and got a different degree in special education so but that’s a problem those are problems, the fit, finding the right fit for you so you don’t get a job that you can’t handle. HR: And I’ll expand on that, you know we mentor a lot of people at Different Brains and a little production studio they’re and our neuro-diverse interns wonderful great productive group and they all have different diagnoses per se and I don’t solicit them they just kind of come but one of the things our whole educational and trade and employment system don’t provide that we try to do is to get give you the exposure to different things so it’s not only about the lighting and sensory issues. Like we have one autistic individual who is extremely smart and very, very good who wanted to be a film critic. And he came in, we tried him with all different things. And the first thing I did was say, “do a critique of the movie the Square Root of Two with Darby Stanfield from Scandal,” that I wrote and produced and directed. He came in the next day and said, “well about the quality of a Hallmark or Lifetime, very amateurish, very amateurish.” But we had him try different things, so Joseph had him shooting, has him video editing, transcription, blogging, and he found out, to his surprise, that he loves and is very good at video editing which is a great art he can. sit in front of that computer and do a great job and I said, “you know you can go make six figures out in LA.” He said, “really?” I said yeah. If you find the job that you love doing in an environment you like and you’re good at it then you can also make a good living and help other people at the same time. That’s a trifecta. And our system doesn’t provide for that. College Internship Program does. Right. MM: Right. Everyone has to have an internship and everyone has to do community service, no matter whether they’re going to college or not, they still have to have an internship because you notice that the med schools now and the veterinary schools and the law schools won’t take anyone unless they’ve actually worked in a law office or a veterinarian office because they get these people who take up space. It’s very expensive to get a veterinary degree and then they become a veterinarian and they don’t want to deal with blood or poop and so it’s a real problem. Lawyers, how many lawyers do you know who don’t practice law anymore with law degrees either can become a politician or retire. So it’s a problem and I would tell parents that you want to have your kid experience all kinds of work environments and volunteer positions because you don’t know what you don’t know. And just because they’re good at they think they’re going to be a video programmer or whatever you know they think of video game whatever, which a lot of them are stuck on, doesn’t mean they really are better at something else or will like something better. I went for an English BA in college and I volunteered at lots of different volunteer positions. When I went to an orphanage on the weekends you know a little you know a station wagon, I guess they don’t have station wagons anymore, but we’re in a station wagon with a bunch of guys and girls from the college and guess what? Doing that community service, I learned I wanted to work with kids and I met my wife in the back of that station wagon with a whole bunch other people. And so that’s what happened and so we need to get them out there doing different things just because you fed their special interest which is video games or whatever and you say “oh he’s really good at this, he knows everything about this” doesn’t mean he’s really good at that. He could be better at something else or enjoy something else even more but that’s when he got attention for and that’s what he was interested in when he was a child. So it doesn’t mean that he’s you know you got to look at the whole picture. HR: What’s the biggest misconception you feel that people have? MM: Well the biggest one that’s diminishing is that the college degree is going to be the way. For a lot of them it’s not going to be the way. They might get a certificate and something at the college and then just have good work experience. You notice that Bill Gates and whoevers was head of CNN, they didn’t even finish their degrees at Harvard and Brown. They didn’t finish them. So they don’t have degrees and so that’s not maybe the best example for these kids because we want them to have degrees that they can and it’ll help them but life experience and work experience is almost as important because if you’re 23 and you come out of college and don’t know how to do your own laundry and don’t know how to take a bus and don’t know how to drive a car or date anyone or you’re going to be like totally, it’s hard enough for a regular college kid to come out of college and figure out how to do all those things themselves if they haven’t lived off campus or anything. So you’re just handicapping your kid, he’s handicapping himself like coming out that way. HR: Well I want to amplify on that in the following sense to our audience, that what I’ve been learning also is that neuroplasticity never stops. Yes it’s greater when you’ve done that but look, you’re an example of how your brain rewired itself well into your adulthood. So I don’t want anyone listening to this to think the only window is up through 26 or any age. MM: Yes, in fact we’re more we’re more childlike, more youthful, more able to make changes at a later–it’s part of the Syndrome. My kids say to me, just one of them said to me last week, “Dad, it’s amazing how you are able to change your life and do and become who you want to become.” And it’s because we do we are long-term learners. We’re fascinated by learning, I’m learning Spanish, I’m writing three more books, I’m doing my Art, I live in two countries and I still make the time to see all my children. So we’re capable of a lot of really good things well into our I’m almost 70 years old and I feel like I’m 23 probably because I’m that emotionally immature no that’s when it goes, comes with the territory. HR: Well you look in great shape and I gotta tell you, what I’ve been learning also is that you know being an MD and everything even being an orthopedic surgeon, but the most underrated things for longevity and health and happiness iand call it “youthfulness” for lack of a better term, are the socialization and using your brain and exercising and getting rid of stress which is my number one challenge I’ve been able to do it, and eating a decent diet which basically is getting rid of all the processed stuff. You know, you can call it Mediterranean or whatever. But I see your habits and it’s not just when you Michael are getting ready to give a talk, it’s also how you wind down. Remember how we were going out to dinner and you are winding down in the pool and the hot tub the end of a very very productive day. MM: You want to talk about wellness for a minute? HR: I would love to talk about wellness. That was my verbose way of saying I want to hear what you have to say about wellness. MM: Yeah let me just say that that ability to change and research the things and then use new information once these kids become self-change agents they can do just about anything if they want to be a physicist or build house they could figure out how to do it. So they’re very smart and once they start working with other people’s bio computers of using the internet and everyone around them and socializing and being able to talk to people and problem-solve, it’s endless what they can do. So this year these are the changes I’ve made this year. Okay I’ve been gradually moving to Mexico, I socialize like amazingly down there with people my age and all the people around me. I’m not afraid to go up and join something or play pickleball or go to you know concert with some other people or go out to dinner. so I have like this different life that I’ve never had before. So that’s just one area. Then I went online and said, “what are the 20 most vibrant foods for older men to eat to stay emotionally vibrant and sexually vibrant?” And they’re like spinach, ginger, you know there’s Avocados, there’s all these things. I never liked avocados in my life, I hated the texture and taste. But now I taught myself in the last two months to eat avocados. I put it in the middle of you know a sandwich and just disguise it with the onions everything else, and I eat it and I’ve gotten to like it. So those are just in that area, just food. Now in exercise, I swim and the place I bought into in Mexico has a volcanic heated pool. They changed the water three times a week, it’s huge pool. I can swim anytime I want, it’s warm in the winter. In the summer it’s always warm. So I swim in that nice water, it’s good for my skin, it’s good for my body and my brain. Then I play pickleball which is very social and you switch teams all the time you’re with other people, you introduce yourself and I’ve met a lot of friends. One of the rules I set for myself in the last few years which changed all of my adolescence all those years I denied myself socialization. And here’s a job reference. So I was the guy who in the office when I packed my lunch, I put it in the staff lounge and then they would come to me, all of the staff, and say “hey we’re going to lunch for Barb’s birthday, do you want to come?” I didn’t have any flexibility to do that. I knew I was eating that sandwich that I made, was in the refrigerator and I didn’t want to go because I would have to talk to people and everything and socialize and what did that do? It handicapped me socially, it handicapped me as far as promotions. It did all those things so I made a rule for myself in my older age, someone says “do you want to come over my house?” or “do you want to do this?” or “do you want to go out to eat on a Friday night” or go to this concert, unless I have an absolutely immediate really important reason to say no, I say yes. And so I’ve grown so much in the last five years even just from doing that. So this is where you become a self-change agent we have to teach our students to be able to do that for themselves. HR: I like that terminology, a self-change agent, a self-advocate too, and a changer. I’m sure a lot of our audience wants to get in touch with you and the college internship program. What’s the best way for them to do that? MM: Well, really the easiest ways for them is to go to collegeinternshipprogram.org and then follow the links for me and anything they want to see that all my videos are on there etc. HR: And what if they want to buy your books? MM: They would go to Jessica Kingsley publishers that’s a really online and it’s easiest way to get anything. So Jessica Kingsley publishers and it’s right online. MM: Okay that’s “Mploy”, it’s millenial. I had to convince the publisher that that is good way of putting it, “Mploy”. And it’s an employment readiness workbook. So “Mploy” an employment readiness workbook. And it can be self-paced. What’s really nice about this book, and this is where the Asperger’s comes in again, I insisted this time that it be utility of language. We didn’t waste words, we made it very clear, lots of graphics, lots of exercises, stories, everything’s to the point, we cut the words out, and made it so you can go through this with a job coach or a parent or even by yourself and self-paced and it starts with the fundamentals of the understanding of the work situation because a lot of them don’t understand that. Goes all the way through every area. HR: What age group is that aimed at, or is it for any age? MM: It’s from high school to college, through college. And ao it’s that age group that it’s written for. HR: Alright, well Michael McManmon we want to thank you so much for being a guest here on Exploring Different Brains. We look forward to continue to highlight your work here at differentbrains.org and any way we can help you and your organization and your son and the College Internship Program achieve your worthy goals, we’re very very glad to. MM: Thank you so much for having me, and I want to say one thing. One of the hardest parts of interviews for me is that I’ve had to learn the social skill of asking you questions and not just talking all the time. So it was hard for me not to say well how is your family, or how is your business community? You know, it was really difficult because now I try to use reciprocal conversation skills, you know, as aspies it’s easy for us to just lecture you. Right? HR: Well our audience doesn’t want to hear about me, they want to hear about you. Michael McManmon, the College Internship Program, thank you so much for being with us here at Different Brains. MM: Thank you very much for having me. 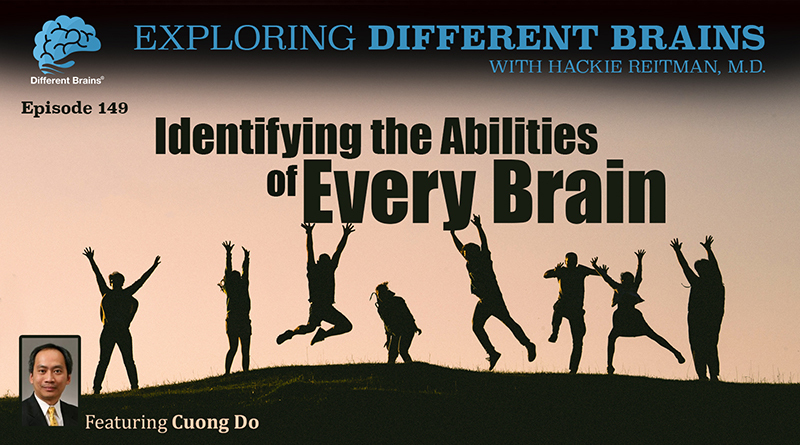 (26 minutes) Cuong Do (founder of the Profectum Foundation, co-creator of Identifor, Autism Speaks board member, and the father to a child with autism) discusses the importance of discovering the abilities of people with different brains. 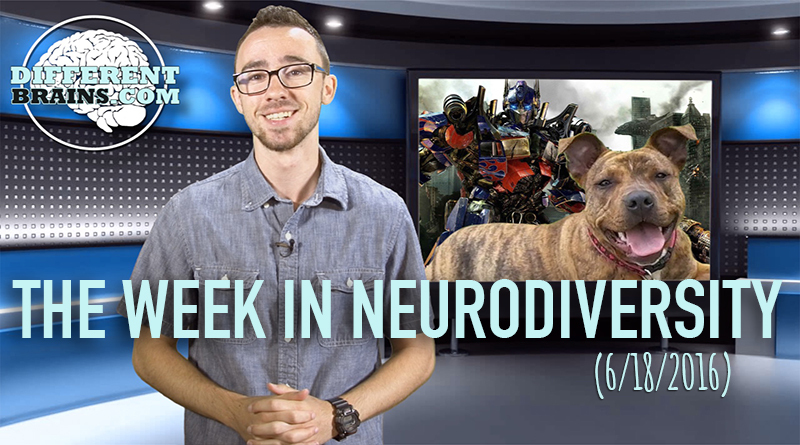 In this episode, a teen with Tourette’s creates a vlog, an author opens up about OCD, and did you hear about the dog with epilepsy that’s going to be in Transformers? (11 mins) In this episode, Harold Reitman, M.D. 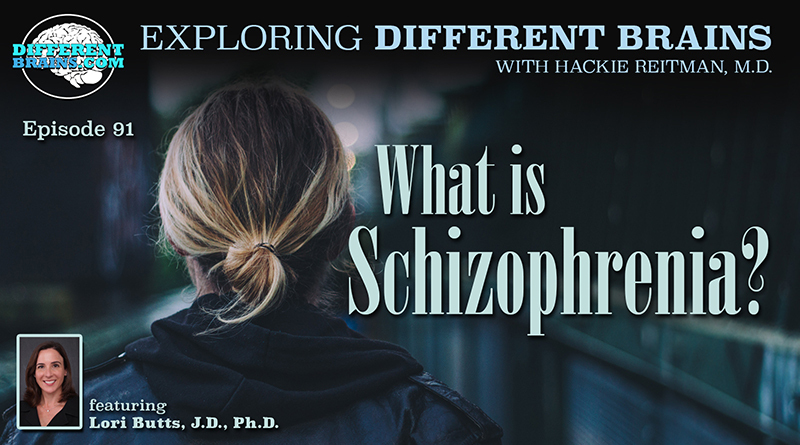 speaks with Lori Butts, J.D., Ph.D., the president and director of the Clinical & Forensic Institute, and previous president of the Florida Psychological Association, about Schizophrenia.